For the ultimate in comfort food, Harry and David created their Lobster Pot Pie. They began with their classic homestyle pot pie recipe and added succulent chunks of coldwater lobster, sweet corn, and potato. It's finished with a sherry cream sauce touched with a hint of cayenne. 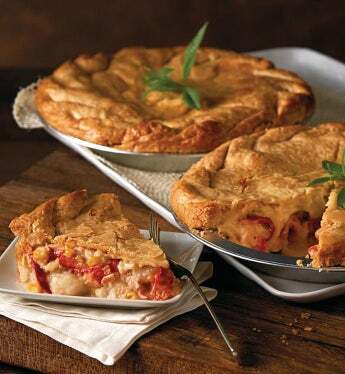 The delectable filling bakes in a buttery, hand-crimped crust for an appetizing, savory entrée..
For the ultimate in comfort food, Harry and David created their Lobster Pot Pie. They began with their classic homestyle pot pie recipe and added succulent chunks of coldwater lobster, sweet corn, and potato. It's finished with a sherry cream sauce touched with a hint of cayenne. The delectable filling bakes in a buttery, hand-crimped crust for an appetizing, savory entrée.